Who knew that two (choreographers) with two (dances) could make an enjoyable evening of six dances? 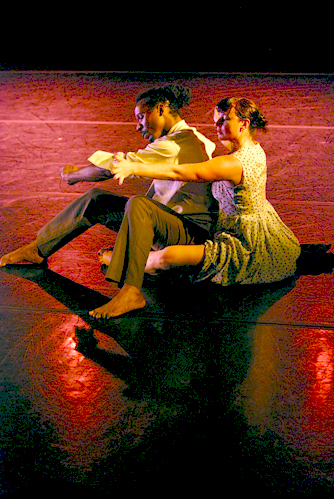 June 13, 2009 Ben Munisteri and Rebecca Stenn tinkered with each other's choreography with the stated aim "It's to see what else is possible." Stenn opened "Chopped and Screwed" with her new "Mirah." A reworking by Munisteri, and Stenn's response or rebuttal followed. After an intermission, Munisteri's 2002 "Arabica" and its confabulations sent us sweetly soaring. The exposed nuts and bolts had little to do with our pleasure. But the choreographers asked for more. We had to think about the dances' structure, which led to picking out differences in the choreographers' style and approach. I longed for another freewheeling Nothing Festival, a choreographers holiday from grant writing, that is, packaging to impress presenters, funders and audiences. But the kind of audience participation "Chopped and Screwed" requires is both novel and nice. There could not be two more compatible artists than Munisteri and Stenn. Stenn's Momix and Nikolai roots would make her amenable to such puzzle making. But she personalized and updated the method. Her dances are obviously narrative, even though she and her dancers come from a shape-making background. Munisteri's singular vocabulary is at once artless and sophisticated. Coupled with uncomplicated but striking theater, his dances yield poetry, mystery, and staying power. Proof is "Arabica," a piece of his seven-year-old "Muse of Fire." It still hits the mark, to house music by Arabica, in bright Lycra costumes by Liz Prince. The delights include perfectly synchronized doubled dancers and Christine McMillan successfully segueing jumping jacks into fouettes. Is a dance ever really the same as the first time? Munisteri has new, commanding dancers in the wings— the doe-eyed, intense, Heather N. Seagraves and the young almond-eyed Katie Weir. Stenn recomposed the piece as a duet for Munisteri dancers, McMillan and Eric Sean Fogel in dressy street clothes. They suggest a married couple on a date. When McMillan does a headstand, we are on alert for something to happen, but turns out nothing does. The headliner here is the barefoot Lori Goldston playing her gorgeous cello composition. The final Munisteri iteration highlights the dawn aubade. "Arabica" is dramatically set against a projected background of stark forest with golden glow (the evocative lighting is by Kathy Kauffman,) and danced to an excerpt of Samuel Barber's "Concerto for Violin and Orchestra." That this original can be successfully twisted and touched in several ways attests to its integrity…though for some choreographers, integrity means leaving well enough alone. First on the program are Stenn's "Mirah" and two transmogrifications. Her choice of music is interesting. Lo, a choreographer can set a single dance to different musical choices— one of the possibilities discovered in this project. "Mirah" original is to indy-folk-pop by Mirah and Spectratone International. The choreographer Gerald Casel comes to mind, but with less cuteness. Munisteri's reworking has more regimentation and gymnastics. His is to jazzy sound by Jay Weissman (Stenn's husband.) He improves the end with a compelling Stenn standing off-kilter, facing an upstage corner, as the music cuts off. Stenn has a group of top-notch dancers. Trebien Pollard, Eric Jackson Bradley, John-Mario Sevilla, Faith Pilger, and Stenn. She redoes "Mirah" with lovely, lyrical movement by Sevilla and a nice ending where Bradley circles back behind the group and fades in the blackout. The coming together enjoyably revealed Individuality and fragile, free expression. Faith Pilger and Trebien Pollard in Mirah.